When it comes to configuring a NovAtel GNSS receiver, there are several pieces that can be configured. - Is this receiver running as a rover, or as a RTK base station. - Is L-band is enabled, and if so, what frequency is it listening to? - Should an SBAS system (such as WAAS) be used, or should the receiver function autonomously? - Should the GL1DE filter be enabled or not? - What baud rate (bits per second) is the data moving at? - Are any start or stop bits being added for timing? Is a parity bit being added at the end of every byte for error detection? - What type of data is coming in on this port? - What type of data is going out of this port? - What messages should be transmitted, and how often? When you connect to any one of the serial ports, you can send commands to change settings for any of the pieces in the system. For example, if you are connected via COM1, you can configure COM2 to send some type of data once per second. You could also set COM2 to accept correction data. Additionally, you can configure the port you are connected to, but be aware of what you are doing. If you change the baud rate of the port you are connected to, you will also have to reconnect to it at the new baud rate. If you change the input interface mode, you may not be able to send any additional commands to the receiver. For example, the default interface mode is "novatel", which is the mode that allows you to send configuration commands to the receiver. If you chance the input interface mode to a correction data format, the receiver will see any subsequent data as bad correction data, not as configuration messages. This means that you cannot send the command to save the configuration, unless you do that via a different port. If you have locked yourself out of a port, there is a reset sequence that will put the port back to the factory default setting. 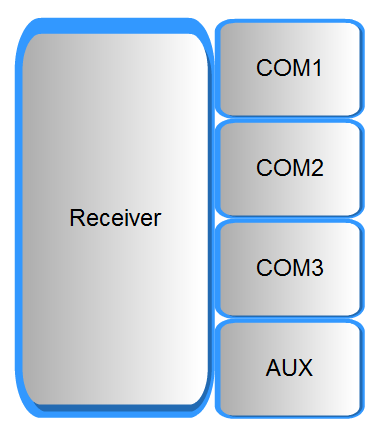 On the NovAtel Smart-MR series receivers, COM3 is connected to an internal Bluetooth module that you can connect to via any device that supports the Serial Port Profile. This is a handy option for configuration changes, but can also be used to send RTK correction data to the rover and to log NMEA position data from the rover. Keep in mind that all wireless technologies will have some occasional latency when there is noise on the same frequency band, so Bluetooth data links are not recommended when the timing of the data is important. Do not change the baud rate on this port. You can change the interface mode, but be aware that when the receiver reboots, it will revert back to the factory default setting. The hardware break sequence used to reset a RS-232 port back to factory defaults does not function over Bluetooth, so the interface mode setting always reverts to a state that allows you to configure the receiver. On the NovAtel Smart-MR15 receiver, COM2 is connected to an internal cellular modem. Do not change the baud rate or interface mode on this port.